You've probably seen them. They scamper around gravel parking lots downtown, nest in Spenard and munch sprouting vegetable and flower gardens all over town. Rabbits already seem to be everywhere in Anchorage. And naturally, they're multiplying. These rabbits aren't long-eared, large-footed wild snowshoe hares - they're domesticated rabbits, the cute, cuddly kind that some possibly well meaning but ultimately uninformed parents give their kids as Easter gifts. Biologist Rick Sinnott with the Alaska Department of Fish and Game estimates there are “easily hundreds, if not several thousand” of them roaming Anchorage now. Anchorage's rabbit problem most likely stems from people leaving their pet rabbits outside, perhaps believing they will be able to fend for themselves (they can't). Or perhaps they realize that the cute little bunny they brought home actually requires lots of time and care, and can live 10 years. Anchorage's Animal Care and Control Center takes in stray or unwanted rabbits. They're lumped together in the shelter's computer system with other small mammals such as ferrets and guinea pigs, said spokesperson Maria Martin, so there's no way to tell exactly how many rabbits pass through the shelter. As of Tuesday, May 16, there were nine rabbits at the shelter: two were owner-surrendered and seven were strays. Shelter rabbits are available for adoption for $5. Although Martin says the shelter recommends that people spay or neuter pet rabbits, it is not stipulated in the adoption contract, as it is with dogs and cats. According to Martin, Animal Control doesn't respond to reports of loose rabbits. They're too quick, Martin said, and Animal Control officers were spending too much time trying to capture them. In fact, the shelter, on Bragaw Street, just south of Tudor Road, has apparently feral rabbits that roam the grounds. “I'll spot one while we're taking out the dogs for walks,” Martin said. Both Martin and Sinnott say that a large percentage of the city's roaming rabbits are feral - the offspring of domesticated rabbits that survived, by their own wits or because people were feeding them, long enough to procreate. Feral animals are not adoptable and are euthanized if they are brought to the shelter, Martin said. The majority of stray rabbits that are brought to the shelter are litters of baby rabbits, which still have adoption potential, she said. Rabbits (and any other animals) must be handleable in order to be adoptable, Martin said; if they're skittish or anxious they're classified as feral. Feral rabbits are as common in downtown Valdez as squirrels in other parts of the United States. There is no definitive account of how they got here. Some people like the, others don’t. 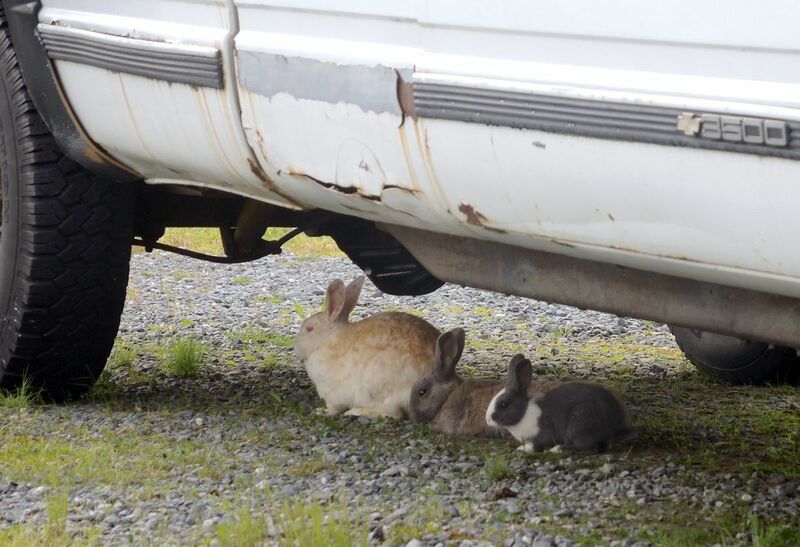 According to Valdez spokesperson Allie Ferko, animal control officers will live-trap adult rabbits on public property if they're "determined to be a health hazard or … actively causing damage to public facilities." Private individuals can also borrow traps to remove rabbits from their own property. Live-trapped animals are simply released a few miles away from downtown. Animal control will spay or neuter baby rabbits brought in by the public and put them up for adoption. GARDEN GROVE – They're hopping all over the county's flood control plain. They're making burrows around the lake where the storm water collects. They're digging into the neighboring school's athletic fields, leaving holes on tracks where children run. Five hundred bunnies can be quite a sight and cute, especially close to Easter. But the situation with hundreds of rabbits at the three-acre West Street Basin, which has been a dumping ground for unwanted pet bunnies, is getting out control, said Bill Hisey, manager of operations for Orange County Public Works. "The bunnies will have to go one way or another," he said. Bunny Bunch, a local nonprofit rabbit rescue group, is trying to catch the rabbits and put them up for adoption. But those left behind will be trapped and sent to the Orange County animal shelter in Orange where many are likely to be euthanized, said the group's president, Caroline Charland. The Orange County Animal Care Center can accommodate 25 to 50 bunnies, said spokesman Ryan Drabek. "We can put them in some of the dog cages if we need to accommodate more," he said. But the shelter does not have a no-kill policy, Drabek said. "We will have to eventually euthanize them based on their health and disposition," he said. The multiplying rabbits became an issue when neighboring Walton Intermediate School started to feel the effects, said Alan Trudell, spokesman for the Garden Grove Unified School District. "It became a public safety and health hazard for us," he said. "There was rabbit feces all over the campus and burrows in our baseball fields. When you're trying to do sit-ups out on the field, it's not the best situation to be in." So now the county is stepping up and trying to get rid of the pesky bunnies, Hisey said. The county has hired a trapping company but has put off catching the critters to give the volunteers time to capture as many as they can, Hisey said. Bunny Bunch members were at the gated and secured area last weekend catching rabbits. Trapping rabbits, although generally accepted, is not a humane way to do it, Charland said. The traps usually resemble a metal cage with a trap door. Even doors with smooth edges tend to hurt the animals, she said. "Most bunnies get crippled or die when trapped and left in the sun for too long," she said. She said the best way to catch the bunnies is to lure them with food into a puppy pen and then pick them up by hand, which is what the volunteers do. The flood plain is not suited for rabbits, especially in large numbers, Hisey said. "We usually get chicks, ducks and anything else that flies in," he said. "But this is the first time we've had so many rabbits." Charland and her group will venture into the area once again this weekend to get more bunnies. "I hope they get them all," Hisey said. The timing for putting these pets up for adoption is bad with Easter around the corner, Charland said. "People like to have bunnies at home during Easter," she said. "But two weeks later, they get bored. And they're back in some park once again, alone and abandoned." MASSAPEQUA PARK, New York (AP) -- Animal rights activists are hopping mad because they can't find the wascals who've been dumping domestic wabbits all over the place. Long Island can be a dangerous place for wandering rabbits, experts say. People have been dropping the furry creatures on roadways, in parks and near school grounds on Long Island's South Shore with increasing regularity in recent months, animal control experts said. Earlier this month, a man was seen dumping 20 rabbits in a box at a train station and driving away, said Nancy Schreiber, a Long Island Rabbit Rescue Group volunteer. "It sounds like someone is raising rabbits and trying to get out of the business," said Gerry McBride, who handles criminal complaints for the Nassau County Society for the Prevention of Cruelty to Animals. The SPCA is trying to figure out who is responsible for dumping the cuddly critters, and the Rabbit Rescue Group is offering a $5,000 reward. The rabbits often can't fend for themselves in the wild and end up starving to death or being killed by raccoons or diseases. Many of the rabbits found by the rescue group have been infested with fleas or ticks. They've been treated, fed, cleaned and put up for adoption. NB: Fleas, ticks, and mites can all cause skin problems for rabbits. According to the San Juan Journal, July 8, 2010 The American Camp rabbits' days are numbered. The National Park Service released for public comment Thursday an environmental assessment that proposes to control the population of non-native European rabbits at San Juan Island National Historical Park’s American Camp. “The goal is to eliminate European rabbits from and prevent their recolonization in the park, which will allow us to protect important natural and cultural resources threatened by this non-native species, said Park Superintendent, Peter Dederich. The National Park Service says the rabbits, introduced to the island between 1875 and 1895, presumably as a food source, prevent native grasses from flourishing on the prairie, which in turn destroys habitat for sensitive species such as the Island Marble butterfly. The butterfly was believed to have been extinct until its re-discovery on the prairie in 1998. Jerald Weaver, the local national park's chief of integrated resources, said the rabbits' removal is not expected to impact the bald eagle and red fox populations. According to a National Park study, the local bald eagles feed mostly on carrion, fish, marine invertebrates, shorebirds, small mammals, waterbirds and waterfowl. The foxes eat mostly mice and voles. Weaver said the foxes, which were introduced to the island to control the rabbit population, are not targeted for removal and will continue to live on the prairie. More than 470 non-native rabbits inhabit about 150 acres of American Camp today, down from an estimated high of 50 rabbits per acre in the 1970s and about 23 rabbits per acre in 2005. U W's College of Forest Resources estimated the population on 173 acres of land as between 95 and 330 in 2009 and 414-884 this year. Richard Weisbrod, a retired professor of the College and co-author of The Rabbits of San Juan Island National Historical Park believes native grasses and rabbits can co-exist. Native grasses have had lots of different herbivores feeding on them — deer, squirrels, mice, rabbits. They are adapted as grasses to tolerate pretty heavy predation. He agrees that while the rabbits have altered the landscape, he doesn’t believe they’ve altered it any more than people have. He further added that they have been around long enough to be part of that ecological system. It's not a wise idea to try to eliminate them. The National Park can manage them where they occur by fencing off the sensitive areas." Many residents and people from outside the area agree. There was an outcry last month after the National Park Service admitted during a public meeting to “gassing a few.” Concerned residents had noticed a steady decline in population over the last few months. This is yet another example of government secrecy and officials thinking they can hide unpopular actions from the public. The University of Victoria tried to do the same earlier this year. People were outraged after the administration hired trappers to rid the campus of dumped domestic rabbits and their offspring. After a huge public outcry and a court injunction preventing them from going ahead, rabbits have been humanely trapped and removed to local sanctuaries and one in Texas. Human interference and trying to ‘manage’ nature inevitably creates more problems, rather than providing solutions. In 2008, South African officials turned their attention to Robben Island’s exploding European rabbit population that was destroying the vegetation of this world heritage site. Feral rabbit numbers dramatically increased after authorities removed 100 wild cats that had been keeping the population in check, but which were also stalking rare birds, including the endangered black oyster catcher. The situation reached crisis proportions with bontebok, springbok, fallow deer and rabbits all starving to death. Nearly 10,000 rabbits were killed after the various decision-makers agreed to carry out a “humane cull.” Robben Island has no natural water source. Nobel Laureate, Dr. Henry W. Kendall: “If we don’t halt population growth with justice and compassion, it will be done for us by nature, brutally and without pity – and will leave a ravaged world."